It is no longer a question of whether the Chinese government will save the market or not. 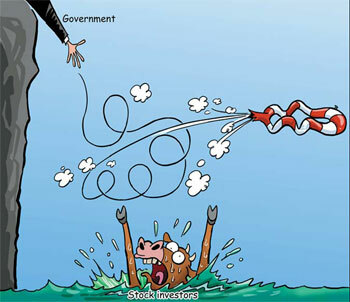 It is whether the government measures are effective enough for today's stock market, which is driven by the law of value. The country's stock market remained very weak after a comprehensive commentary issued by Xinhua News Agency, which was seen as a signal of government policy support. The commentary, published on front pages of China's main financial newspapers on July 2, said the country's stock market is capable of achieving stable and healthy development given the strength of the country's economy. But performance in the days after the commentary remained far from encouraging, with the last day of the week - July 4 - seeing the benchmark Shanghai Composite Index fall 1.24 percent to close at 2669.89, with 474 of 907 stocks down. State-owned Xinhua published a similar commentary on the stock market 16 years ago after a long bear run on the market. The commentary was followed weeks later by the establishment of the China Securities Regulatory Commission (CSRC) and a major recovery by the market. Securities analysts, experts and economists who agree that the government is strongly committed to creating a good environment for stocks, say the market has gradually emerged from the shadow of a "policy-support market". "Xinhua's commentary appeared after the market had experienced consecutive declines. It showed the government's insistence on maintaining a stable market," Liu Kaixuan, an analyst with Shanxi Securities, says. "It should have been a signal for government policy support, but it failed to have an effect on the market," he says. "The country's stock market has evolved into a value-driven era, when any single element or short-term policy stimulation can't change its movement," Niu Xiangyang, analysts with China Galaxies Securities, says. Since the beginning of this year, the country's stock market has experienced intense turmoil, but a series of government regulatory measures simply failed to drive the sentiment up. To relieve the market after it fell to half its peak in October 2007, the government changed the tax policy on April 24 by slashing the stamp tax from 0.3 percent to 0.1 percent. But the measure - a clear signal of the government's determination to bolster the fragile market - failed to change the stock market's decline. Apart from short-lived rebounds, the market gave a cold shoulder to the most aggressive stimuli to date and continued to slide. On April 20, several days before the tax policy change, regulators announced curbs on the sale of non-tradable shares that came out of lock-up periods. Except for a short-term fluctuation, the measure, aimed at controlling floods of shares coming into the secondary market, which could "put constant pressure on stock prices and distort the price formation mechanism", according to CSRC, also failed to stop the market's plunge. "It has become very difficult for government stimulation policy to relieve today's stock market because the capacity of the country's stock market is ten times larger than 10 years ago," Qiu Yanhuai, an analyst with Haitong Securities, says. "In today's market, the performance of stocks mainly depends on the overall fundamentals, including the country's macro economy, especially the inflation rate, corporate earnings, corporate future development and the corporate governance," Niu says. "At the same time, the international factors, including the growing international price of oil, the depreciating greenback, the slowing US and European economies, also have a great influence on the country's stock market," he says. The market will not rely on any single element but the maturation of all the components and factors although the country's stock market has not yet completely emerged from the shadow of a "policy-support market", Niu says.